I love Terry & the Pirates, Milton Caniff's comic strip that ran from the mid-30s to the mid-40s. (See here and here.) So I am please to have been able to buy two minor examples of Caniff's masterpiece. This one is from a point relatively early in the run. This is a high-contrast black and white reproduction of the piece. Compare it to the color reproduction. Hmmmm, there is a lot of blue here. What is it for? It's purpose will be obvious when you see the printed version of the strip (reproduced here from The Complete Terry and the Pirates volume 1). Caniff used blue to indicate to someone in the newspaper production department where he wanted half-tones. Caniff was very much influenced by studio-mate Noel Sickles. Sickles used a high-contrast chiaroscuro drawing style, and Caniff did the same--using half-tones to add some grey to the mix. But by 1945 (and all through his subsequent strip, Steve Canyon), Caniff abandoned that. He just used pen and ink with no mechanical halftones. Notice the line across the bottom of the panels and across the top of the first panel. I have no idea what those are all about. They don't appear in the printed version, of course. 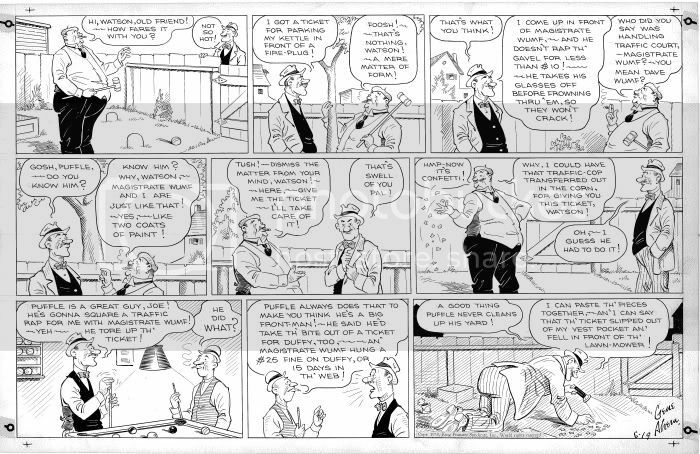 The third piece I got is a Sunday strip from what was a one-panel comic, Room and Board by Gene Ahern. On Sunday's he got to try a little sequential storytelling (although he did tell stories in the daily strips--he just told them one panel at a time). Here is a slightly more readable, high-contrast black and white version. Ahern was a wonderful artist for depicting the lives of sometimes pompous but usually fun-loving working-class America. This strip is almost a carbon copy of his earlier (and more successful) strip Our Boarding House. The reason that Room and Board exists is that Ahern was offered a better deal from a new syndicate in 1936, but the old syndicate owned Our Boarding House. So he just cloned it and renamed it, no doubt thumbing his nose at the old syndicate as he did. A couple years into WWII the papers, like everyone else, were trying to save resources. The comics syndicators offered their client newspapers a way to save space, and thus paper, by offering cropped strips. Any paper could print the entire strip or cut it off along that bottom line, using the resulting saved space for more comics or for other news items. The line at the top of panel one had the same purpose. A paper could print the comics' title there instead of above the comic strip. Allan Holtz's blog posted a 1943 ad trumpeting that first panel notch. That would be at Holtz's strippersguide blog - the August 9, 2006 entry. Thanks for the info! I kind of figured it might be something like that. Love it! I've been tracking down the topper strip to Room & Board, "The Squirrel Cage," and I think it's a forgotten masterpiece. Some of the stuff in those strips with The Little Hitchhiker (esp. from the late 40s) make Krazy Kat seem about as surreal as Dondi. I've also been enjoying some of the Room & Board strips that lean in the surreal direction - usually through the dreams of Judge Puffle. If you have leads on any such strips or art I'd be grateful. Oh - and incidentally, the correct spelling for the surname is Ahern (as signed in the strip). "Ahearn" has been corrected to "Ahern."